We are heading into what is already a very green summer. 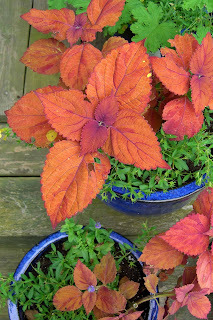 Rain has encouraged both flowers and weeds. Kudzu and English ivy already blanket many trees and trail off into the lower branches. 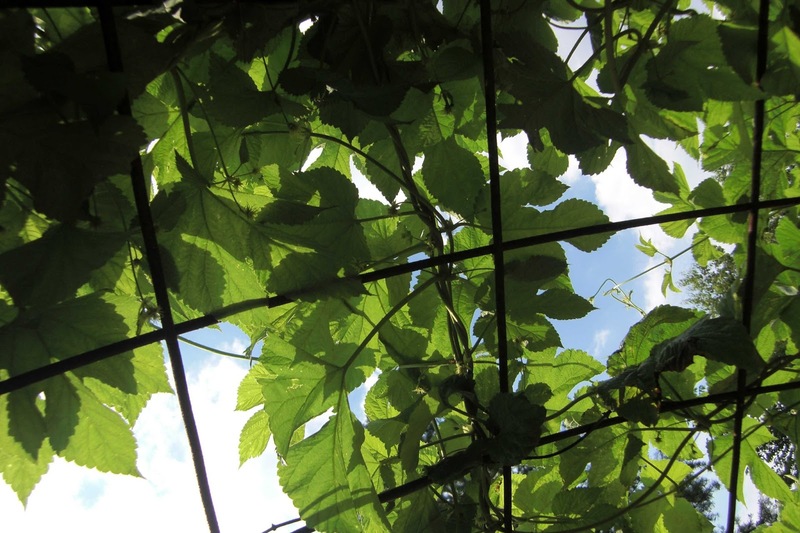 I stood under an arbor and looked up through the many shades of green, a tangle of leaves contrasting with the grid of the arbor. There was summer, right over my head. Last week I watched Elin Noble's class at QSDS carefully measure and mix a variety of animal, vegetable and mineral substances to create mordants and natural dyes. Odd smells sometimes wafted through the halls. The names sounded like something from an ancient book on witchcraft: fustic, weld, lac, cochineal, gall nuts. These dyes came from far-flung regions. Some of them originally traveled with spices and jewels along the silk road and were almost as precious as their traveling companions. 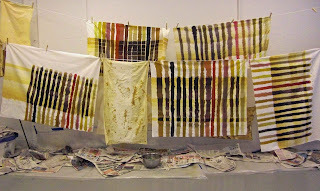 Students painted mordants from selvedge to selvedge, then the dyes from cut edge to cut edge. 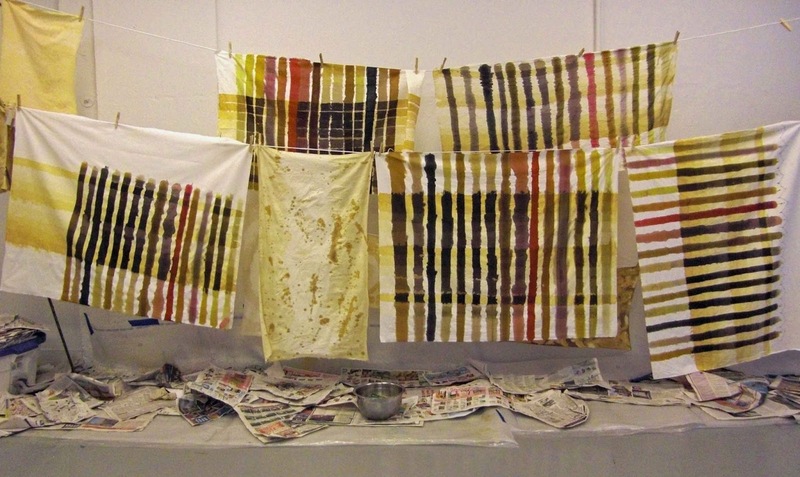 Dyes and mordants combined into plaids, darker, brighter or more yellow where each dye crossed each mordant. Everyone walking down the hallway stopped to look at the clothesline strung with overlapping, graphically arresting plaids. They are more than beautiful. Each cloth is a map which can guide its owner back into an ancient and exotic world. It's good to have a landmark, especially if you are not that familiar with your surroundings. A large red ART sculpture rises from the center of the Columbus College of Art and Design campus, making it easy for new students to find their way around. 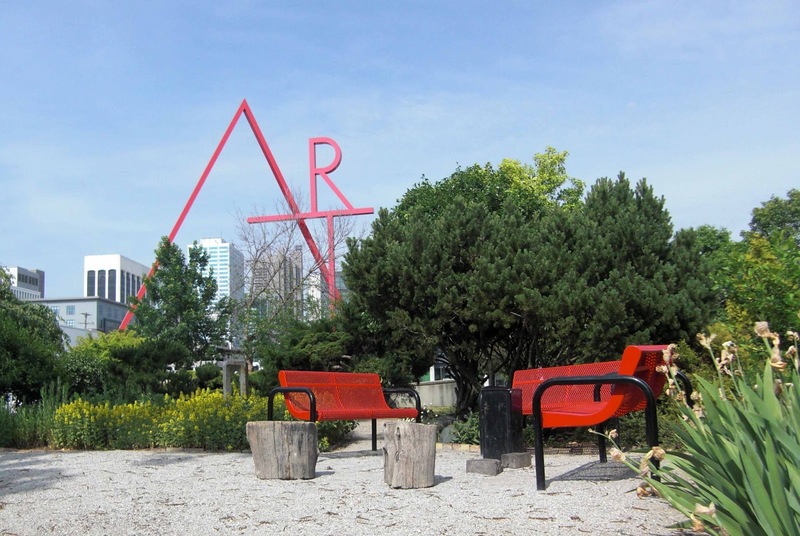 Red appears on doors, signs and the benches in the campus garden. Those of us who attend QSDS, the Quilt/Surface Design Symposium, feel very fortunate to be here for two weeks, wandering in the garden and orienting ourselves by that big red ART. Modern architecture can be boring and soulless. But once in a while, it rises above the mundane. 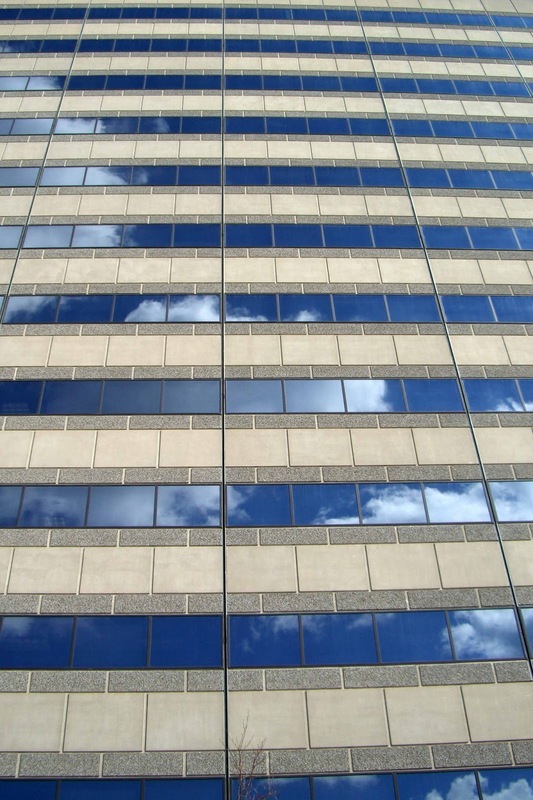 Large swaths of glass windows are a common denominator in many office buildings. 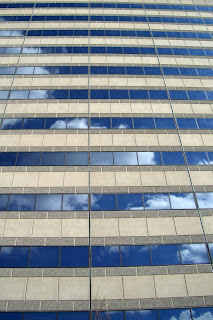 On a sunny, windy day, I watched the clouds reflected in the strips of windows behind me. A perfect mirror, the glass turned bright blue and white, strips of clouds and masonry sewn into an animated quilt of the simplest and yet most complex pattern.